The Collinsville Cardinal Homerun Club cordially invites you to attend the annual baseball DIAMOND DINNER and silent auction on Saturday January 27, 2007 at 6:30pm at the Middle School. Addressing the CHS baseball team, parents and friends Saturday were (L-R) CHS Head Baseball Coach Tony Reeder, KTUL TV Channel 8 Sports Announcer Ruben Diaz, and former major league baseball players Rick and Bill Wrona. Just a few of the 2007 CHS baseball team members are shown below. A few others were playing basketball for CHS at Pryor. 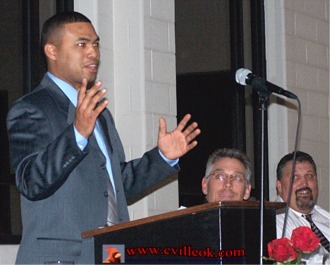 Ruben Diaz was emcee for the evening at the Collinsville baseball boosters' fund raiser. 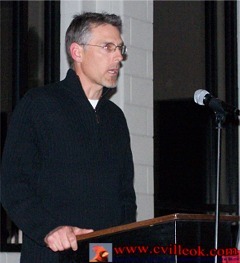 Rick Wrona spoke to the high school players about his baseball experiences. Rick Wrona was a 1982 Bishop Kelley (Tulsa) grad and played at Wichita State before several seasons in the major leagues until 1998. The CHS baseball field will be presented an award soon as the "Regional Field of The Year" for the east half of Oklahoma. Just 5 weeks from opening 2007 baseball season (with a few scrimmages before that). Lost several seniors from last years 30-7 team and anticipates more of an underdog role for his young team this year but no less expectations for success. New press box and permanent seating still under construction.